Today I have another Halloween design! 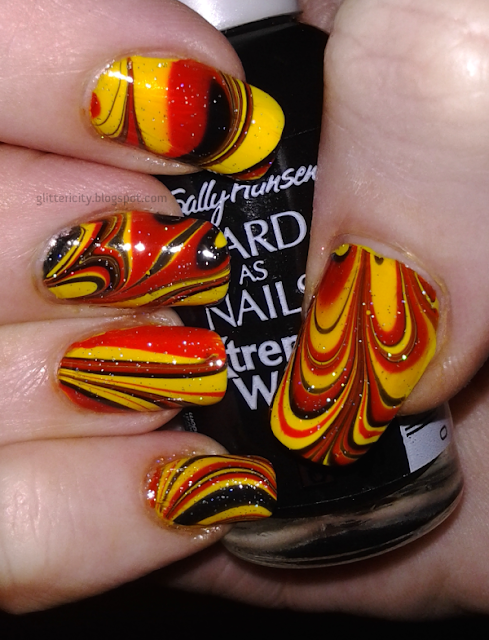 I wanted to do a marble with Halloween-y colours. 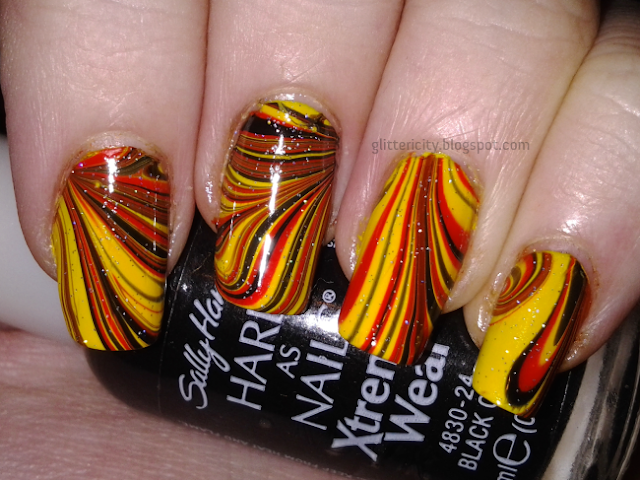 I thought of involving green or purple, then considered doing candy-corn colours, and finally decided on one with black, yellow, and orange. Here's how it turned out! I swear that's orange. I think I should have used a lighter version. This looks more like a German-flag marble. Sind diese hübschen, Deutschen? The three shades I used for this are Zoya Darcy (yellow), OPI A Roll in the Hague (orange), and Sally Hansen Xtreme Wear Black Out (black, shown in the photos). 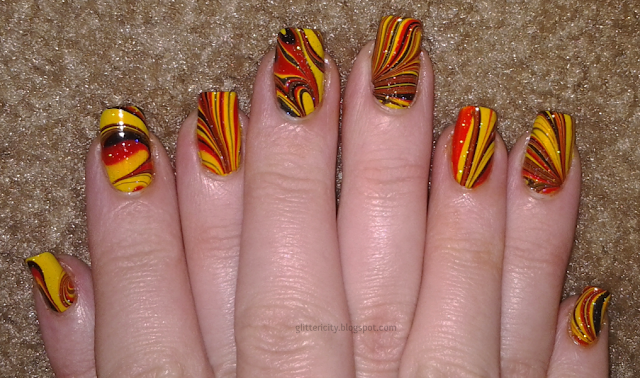 All these polishes work great for marbling. 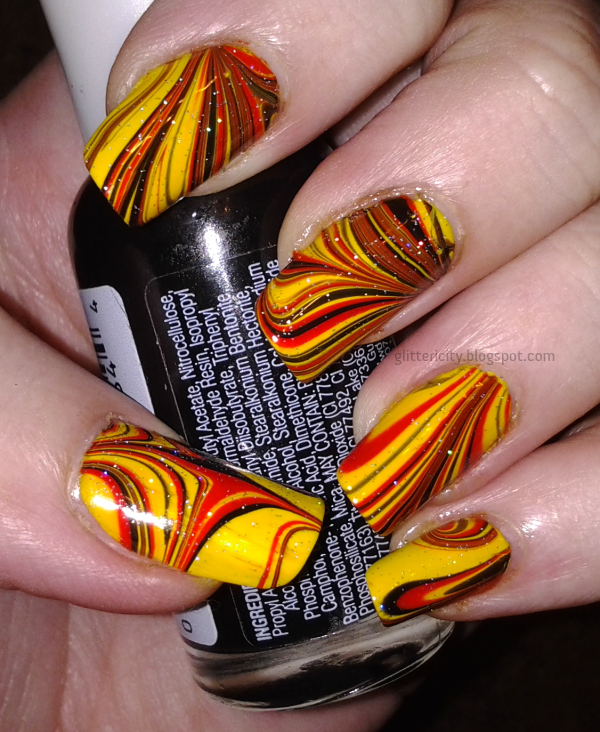 I used Darcy for my base and did random swirls in the water. I then topped it with a coat of INM Northern Lights for some sparkle. I love how the thumb came out. Apologies for the weird angle, though. Right hand is not used to being photographed. This pose is more awkward than two naked guys connecting on Chatroulette. all together now! With feeling!